The chart actually understates the improvement.Â Spain itself is part of the Euro average. So are the other countries in trouble: Greek and Irish labour costs have also shrunk, and Italian ones have plateaued. If you look at Spanish labour costs relative to the trade-surplus Euro core (France, Germany, Netherlands, etc) the improvement is even sharper. Of course I’ve no reason to think that 2005 represented something like a long-term equilibrium. But then again, Davies doesn’t explain why he takes 2000 as the base, except that the Spanish series begins then. The take-home point is that Spanish labour costs are converging quite rapidly with German ones: by 10 percentage points in 5 years. You can’t envy Mario Draghi. His job is to enforce a cruel recession on Spain and the other troubled countries while provoking a small inflationary boom in France and Germany, and without infuriating anybody beyond endurance. He’s not doing too badly. Why would reduction of labor costs be a good thing for Spain? Unless you see an implicit good in paying workers less. When did “competitiveness within the Eurozone” become a higher ambition than a good life for your citizens? Agreed. It amazes me every time I hear an economic commentator lauding the latest increase in “productivity” when none of those “productivity” gains go to workers. It really comes down to the basic question: WHO is the economy supposed to be for? When “gains” are only seen as the advantages that are enjoyed by employers, and any increase in wages is viewed as an economic tragedy, something is very, very wrong. It isn’t a higher ambition than a good life for the citizens of Spain. It’s a necessary condition for the good life of the citizens of Spain. The alternative is to continue at 25% unemployment. If you can suggest to me how the Spanish can reduce that rate that does not include a decrease in labor costs, I’d love to hear it, because I don’t see it. Unless you think the Germans are going to sign on to permanent and enormous fiscal transfers to Spain, that imbalance in labor costs is utterly fatal to the continued existence of the Euro. You can ask all of the questions about who the economy is for that you want, but it doesn’t change anything. Some way or other, the trade imbalances in the Eurozone have to reverse themselves. The only way that’s going to happen is if labor costs become close to equal. I’d argue that they probably need to go further and Spain is going to have to have lower labor costs until such time as they manage parity in capital goods and infrastructure. You can make an argument that Spain would be better off telling the Germans to go away and take the ECB with them and I might agree with you. 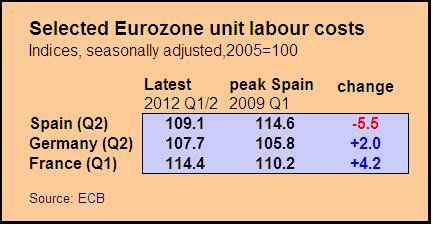 However, ditching the Euro isn’t an alternative to reducing labor costs in Spain. It’s a method of achieving it. The first thing that would happen is that the new Spanish currency would crater and they would find it almost impossible to borrow foreign money denominated in it. Reality dictates that Spanish labor costs need to go down. It’s really that simple. Couldn’t have put it better, or as well, myself. In spite of everything, Greece is still in the euro: both Greek and German leaders agree on one thing, that a Greek exit from the euro would be very, very painful. For Spain, it would be catastrophic. Whether you like it or not, current policy in Madrid and Brussels and Paris and Frankfurt and Berlin and Rome is to keep the euro afloat, at terrible cost to Spanish and Greek and Irish workers. Is the plan working? Davies’ chart suggests that it is working, slowly but steadily. It’s less of a good thing and more of an unavoidable thing. If unit labor costs are too high in one European country, businesses can just go elsewhere (within limits — not everything can be outsourced, and there are also costs to outsourcing, especially across continents, which is why the lower unit labor costs in the US and Japan do not affect Europe much). Unit labor costs were a big concern in Europe even before the Euro was introduced. Note in particular that the issue here is unit labor costs (labor costs relative to productivity), not labor costs. You can lower unit labor costs by either lowering labor costs or raising productivity. At the moment, labor costs in Spain are being reduced because in past years they rose more quickly (far more quickly, in fact) than productivity, increasing unit labor costs too much and decreasing competitiveness. In the long term, however, the better solution is increased productivity. There has been much talk about German workers forgoing wage increases during the aughts, but German wages are still fairly high, and what really underpins the German/Swiss/Austrian model is having a highly skilled labor force. To that end, these countries have been subsidizing tertiary education (both college and apprenticeships) heavily for decades. Skilled labor not only reduces unit labor costs by increasing productivity, skilled labor is also far more difficult to outsource. And no, cutting public spending is not exactly the best way to go about that. The good in paying workers less is that Spanish goods become cheaper overseas and foreign goods become more expensive. This reverses the trade (or current account) imbalance. AnBheal and kathleen only have an argument if either they think that the imbalance is a good thing or if they have an alternative way of increasing Spanish competitiveness. Do they? Taking your argument a step further, let’s say the Spanish increase their competitiveness by increasing “productivity” (getting more for the payment of less in wages). What happens next? The countries who competitiveness has been reduced relative to Spain’s will then need to increase their competitiveness through reduced wages for their workers. This is recognized by many to represent a “race to the bottom” for workers, and is the main reason that trade agreements are a bad deal for workers. Global trade ignores the fact that living costs are not the same in all places, but expects worker wages to compete in all places. Works great for big business; for workers, not so much. Whose economy is it? JMN, you are doing God’s work in this thread, truly. Thanks. I am about as pro-labor and left as anyone who has observed the evidence of the past 100 years could possibly be, and yet I agree with you 100 percent. Given the constraints of the system that exists, I have yet to see anyone empirically demonstrate that a situation like that of the southern European states in the current crisis does not dictate some degree of austerity. I lament that it comes to that, but frankly, there was a lot of left wing consensus around the emergence of the Eurozone in the first place, despite concerns that exactly this sort of situation could emerge, and the anti-Euro populism that did emerge at that time mostly came from the right. Keynes? Krugman? I understand the political realities rule them out but from a purely economic standpoint, what about these? I’ve always heard a lot of thumping on the Left (including right here on RBC, IIRC) about how the austerity Europe is embracing is exactly what they should not be doing, that it will make things worse and lead to a slow (decadal) recovery if any. So given the data in this post, we’ve been wrong about this then, yes? There’s austerity where you cut fat and austerity where you are eating your seed corn. There’a austerity that is socially responsible (where nobody is asked to contribute more than they can) and austerity that is not. The biggest problem is that the austerity programs currently underway tend to be of the seed corn eating, socially irresponsible variety. Germany does not need to increase or restore its competitiveness vis-Ã -vis Southern Europe. Germany, like China, would do just fine in rough trade balance not structural surplus. justified by this data set? Is there some data which is not normalized by country that justifies the take-home point? I confess I would be surprised to find that Spanish labour is better-paid than German labour. The GDP per head is irrelevant. The problem is to find some point in the future at which German and Spanish costs per unit of tradeable output (including services like tourism) are in rough equality, so there will no longer be a structural current-account imbalance requiring unsustainable offsetting capital flows or fiscal transfers. Neither I nor Davies have evidence as to what it is. So I stated my conclusion in the form of a movement towards that unknown equilibrium. Theoretically it may have been overshot already, but in that case Spain would be out of crisis. but the method used is to compare Spain to Spain and the Euro Area to the Euro Area. but as a result I fail to understand why either of you (or Kevin Drum) are using this normalized “convergence” as a measure. I see no evidence it represents a genuine quantity or relationship, and the sensitivity to the year of renormalization should hopefully make that obvious. Here’s a quick chart from 2010 (“LohnstÃ¼ckkosten” is German for unit labor costs). Briefly, average unit labor costs right now are lower in Spain than in Germany. The big problem is not high wages in Spain, but comparatively low productivity. As Daniel Lampart, the chief economist of the Swiss Federation of Trade Unions noted recently (the article is in German, but if you run the link through Google Translate, the translation is pretty good), this is primarily because of shortcomings in Spain’s education system, which doesn’t produce a sufficient number of highly qualified workers. Somewhat simplified, if you have a low-skilled labor force, you’re competing with other countries with a similar profile, not with Germany or Denmark. That’s why, as I noted above, Spain needs to fix its productivity (probably via the education system) in the long term. Lower wages are at best a stopgap measure; they may be unavoidable, but there’s a considerable risk of Spain eating its seed corn. That’s exactly the sort of thing I was looking for, thank you Katja! I agree about “eating the seed corn”; severe wage cuts and austerity in education would presumably only exacerbate the severe productivity gap. So is the take away also that austerity works? No. The takeaway is that the political constraints of the Eurozone don’t permit any alternative to austerity. As I said above, if you can somehow get the Germans to sign onto some combination of looser monetary policy and large fiscal transfers to the periphery, then James’ conclusion can be avoided. However, there seems to be zero possibility of that and it is beyond the control of the Spanish. Given those constraints, austerity is the only option the Spanish have, although they can pick one of a number of ways to implement it. Regardless which they pick, though, the crisis isn’t going to be resolved until they are competitive with the Euro core again. James, please read Paul Krugman.